"Our warning time is cut from 15 minutes to 30 seconds. Nobody knows if they can hit a target at a range of 6,000 miles, but from Cuba, they can't miss." Nowadays, the term 'docudrama' brings to mind sordid images of Amy Fisher and other sexploitation television miniseries. Hard as it may be to believe now, the networks once believed that the public would watch serious political drama. 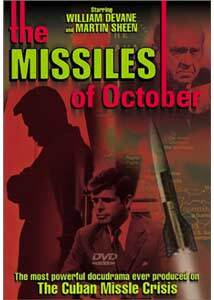 Hence The Missiles of October was created, dramatizing the 13 days in October, 1962 when we came within a hairsbreadth of nuclear holocaust. When I saw the original airing decades ago, it was firmly implanted in my mind as a gripping and highly suspenseful drama. Thankfully, on reviewing all these years later, the performances and the script still hold up as superior to nearly anything presented on television since. In the wake of the abortive invasion at Cuba's Bay of Pigs, the USSR began surreptitiously installing short and medium range intercontinental missiles with nuclear warheads on the small island nation. U2 spy planes revealed the existence of these missile bases, leading President John F. Kennedy (William Devane) to a toe-to-toe diplomatic confrontation with Soviet chairman Nikita Khrushchev (Howard DaSilva). Berlin and Turkey, as well as Cuba, had to be considered on the international diplomatic chessboard, with the everpresent risk of nuclear war. Although there was significant pressure to immediately make a military strike, JFK held to a more controlled and methodical response, making things safe for us to watch our DVDs. But the program doesn't make the doves the heroes and the hawks villians; everyone is given a fair shake at characterization and believable positions and responses. Khrushchev in particular is pictured with a number of sides, one of public posturing and one of insecurity in dealing with his own Presidium and their hawkish motivations. Kennedy is also portrayed as human, agonizing over his decisions and second-guessing himself at every turn, not above considering the political consequences of his actions. The performances are all outstanding. Devane makes a definitive JFK, capturing both the look and the sound of the President. Martin Sheen, as brother Bobby Kennedy (in prep for his current role on The West Wing) occasionally slips up with the Bostonian accent, but otherwise captures RFK's intensity and humor well. One of the most outstanding performances is by Ralph Bellamy as Adlai Stevenson, the UN ambassador. He combines diplomatic slipperiness with strength of character to make an unforgettable portrayal. Surrounding the primary cast is a raft of veteran character actors, including some of my favorites, John Dehner (as Dean Acheson), Dana Elcar (Robert McNamara) and John Randolph (Undersecretary of State George Ball). With a cast like this, it would have been hard to go wrong, and the program doesn't. Clearly the budget all went towards the cast; the production values are nearly nil. Other than a spartan Oval Office, nearly all of the sets are nonexistent or so shrouded in darkness as to be inconsequential. This has the incidental underlining effect of making the presentation seem expressionistic. Indeed, it brings to fore the Kafka-esque sensation of the sight of two nations, neither of which wants nuclear war, inexorably challenging each other to the brink and beyond. As far as I am aware, the program is quite accurate from a historical standpoint. Even so, it makes for excellent drama, with almost unbearable suspense as the stakes continue to be raised between the US and the USSR. Even though we know that there was no nuclear war, it's almost like seeing a Flash Gordon serial and wondering how the heck the hero is going to get out of the jam he's in. The artful intercutting of nuclear test footage greatly enhances the suspense, especially as it emphasizes the then-greater success rate of the Soviets against the US, who marked up four failures out of six attempts in the months preceding the incident. Luckily for us, the right people were in the right places for us to escape total destruction. Image Transfer Review: Sadly, this important program was shot on videotape. While this lends a certain immediacy to the action, it also leads to numerous dropouts on the source material. There is video noise and the picture is very low definition. Thankfully, no edge enhancement has been added to make things worse, but this is a pretty sad picture. It's very soft, with numerous compression artifacts and jagged lines. Skintones tend toward orange, with yellow highlights. Even though the source material is marginal, MPI did not do justice to what is there; a two-and-one-half hour movie should not be on a single-layer disc. The video bitrate is a scanty 2-3 mBps, leading to a slightly digital appearance. Audio Transfer Review: The original mono is provided. Again, as it was mostly recorded live, there is all kinds of extraneous noise, hum and hiss, as well as occasional buzzing and high-pitched squeals. Again, a low bitrate doesn't do the sound any favors, with a 96 kBps audio rate, which is the lowest I think I've ever seen on a DVD. Dialogue, however, is fairly clear even though the music is very tinny throughout. That's vital for a dialogue-heavy program such as this one, and thankfully the various compromises don't get in the way too badly. Extras Review: Not much is presented. There is a useful chronology of the crisis in the pamphlet that accompanies the DVD. The disc includes what purports to be a TV spot, but a disclaimer seems to indicate that it was put together by MPI and was not part of the original program. The chaptering is pretty much inadequate, although the design of one chapter for each day, plus opening and closing titles, has some merit. English subtitles are provided, though they were clearly done by someone without any clue about history whatsoever. MiG fighters become 'big fighters.' Dean Rusk is referred to as 'Russ'. UN Secretary General U Thant comedically ends up both as 'due time' and 'Yutan'. Such unintentional comedy detracts from the seriousness of the proceedings; clearly the disc was rushed out to capitalize on the release of 13 Days on DVD. I, for one, wish that MPI had held off and put a little more effort into this release, because it deserves it. Despite marginal source material and a poor transfer, this program is must-see viewing that garners my highest recommendation.